Great on seafood and sushi dipping, steak, tofu and potsticker. Ingredients: Soy Sauce (Wheat, Soybean), Water, Distilled Vinegar, High-Fructose Corn Syrup, Salt, Flavour Enhancers (E621, E631, E627), Lemon Juice, Citric Acid, Natural Orange Flavour, Succinic Acid, Preservative (E211). 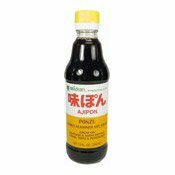 Simply enter your details below and we will send you an e-mail when “Ajipon Citrus Seasoned Soy Sauce (Ponzu) (日式柚子醬油)” is back in stock!